Not too long ago I was waiting in line at a restaurant and in the front was an Italian mama making the gnocchi that was on the days menu. Gnocchi has been on my mind ever since and when I recently came across a gnocchi board I knew that it was time to make some! Gnocchi are small soft dumplings that can be made from various different ingredients, though these days they are commonly made with potatoes. At first I was going to make potato gnocchi but then I remembered that I had some pumpkin puree that was looking for a home and I figured; Why not add more flavour by using the pumpkin to make the gnocchi? Gnocchi can be a bit time consuming to make but it is also a little fun so I always enjoy it. If you are making a gnocchi that requires you to roast something like the potatoes or in this case, a pumpkin, it is always nice to do that a day or so ahead of time to cut down on the effort required on the day that you make it. Once you have your wet ingredients you simply mix in flour until the dough is soft, light and not too sticky to work with. From there you roll the dough out and cut it into small pieces and if you like you can roll the pieces over a fork or other ridged surface to give it more nooks and crannies so that it can hold more sauce. Next you cook the gnocchi in boiling water briefly and then you are ready to use them in whatever dish you desire. Although the soft just boiled gnocchi are really good, every once in a while it is nice to fry them up in some butter after boiling them to give them a slightly crispy outer layer that conceals the softness inside. If your pumpkin puree is really wet, simmer it in a sauce pan to dry it out a bit and then let it cool down. Mix the egg yolk into the pumpkin puree. Mix the salt and nutmeg into the flour. Mix enough of the flour into the pumpkin puree to form a soft dough that is not too sticky to work with. Knead the dough for a minute and then roll it out into 4 long thin rolls about 1/2 inch thick. Cut the rolls into 1/2 inch pieces and then roll the pieces in flour lightly shaking off any excess. 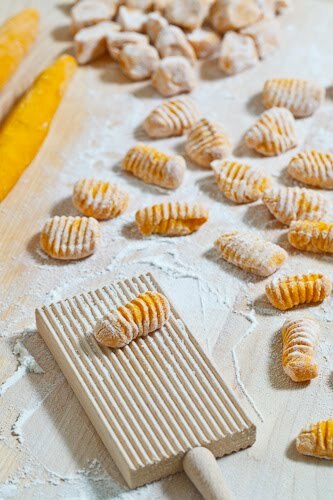 Roll the pieces over a gnocchi board or a fork to give them the ridges. Cook the gnocchi in boiling water in small batches until it floats to the surface, about 2-3 minutes, remove and set aside to drain. Kevin, this Gnocchi looks amazing! And made from pumpkin… I would love to try it. never had pumpkin gnocchi before! sounds amazing. Thanks for all the variations on this wonderful dish Kevin. You could start your own cookbookw with all the amazing recipes you have collected over the last while! Yet another great idea on using the pumpkin. Your blog is one of my favorites for creative ideas and inspires me to cook and bake, which I have recently started doing. I'm a vegetarian and you give so many great options. Thank you again! I think this would be a fabulous dish! You are so smart to create something like this. Much healthier than potato too. I have been thinking a lot about gnocchi myself. I am going to have to try this pumpkin version. That little board is adorable. I have to get one of them too. Gadget love! You must have had a LOT of pumpkin puree – the number of pumpkin dishes you've done the past few months! I have to admit, I'm not a fan of gnocchi. I think I've been put off by the cheap potato versions you cna get nowadays. These looks so delicious! Pumpkin gnocchi have been on my radar for a while and I love how easy this recipe seems! To dry my pumpkin puree out I place it in a colander set onto a pan,and let it drain. For pies I will let it sit overnight. The next morning it will be ready to use. Mmm! I've had pumpkin gnocchi in a restaurant before and loved it, so perhaps I'll get brave enough to give this recipe a try. Looks delicious. My first love is Jesus…then my wife of 45 years…then cooking. I really enjoyed looking over your blog. I am now a follower of yours. Feel free to look over my blog and become a follower of my blog also. I have been dying to make pumpkin gnocchi for ages and it doesn't seem like a difficult recipe…just a bit time consuming? 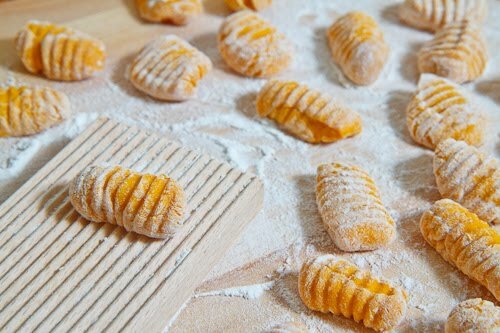 When I have some free time (in a few years once my 2 year old doesn't require so much care) I want to make my own gnocchi and my own pasta/ravioli. Oh and lasagna too. Oh my goodness! Yummy! Yummy! This pumpkin fan plans on going thru your other pumpkin posts too! Awesome. I have a kabocha squash sitting in my kitchen and was wondering if I could make gnocchi with it. Definitely doing it this weekend. Thanks! Those gnocchi look amazing! Where did you find that little gnocchi board? It is so cool! I never knew there was such a thing as a gnocchi board! It makes much deeper ridges than a fork. Very very cool! You are amazing!! Looks and sounds incredible. What an amazing idea! I have never made my own pasta before but you make it look so easy! I have all the ingredients on hand, so maybe on my next day off I'll give it a try! I love your blog, and this post. I have never made gnocchi, but it's high on my list of things to make. Thanks for breaking the process down! miss ambree: If you are in Toronto, I got mine in the little kitchen gadget store in the middle of the Saint Lawrence Market. Otherwise, I also saw them on amazon.com. Sounds delicious! I'd love to try it but I just tried making regular gnocchi it and flopped. When I put the little potato dumplings in the pot of boiling water, they rose to the top almost immediately after I dropped them in. I cooked them a few more minutes because my cookbook said they should rise to the top after about 2 minutes of cooking and when they got to the top they would be done. I have no idea what happened. I'm kind of skittish about trying gnocchi again until I figure out how to prevent that from happening. I made these last night with the gorgonzola cream sauce. They turned out great! I love reading about your creative recipes and was excited to try this one. The gnocchi came out pretty good, but I have to say I ended up using a lot (more than double) the recommended amount of flour. Any suggestions on how to maximize the pumpkin flavor with less flour? Thanks! Cynthia: You can remove some of the liquid from the pumkin purée first by straining it or simmering it. Mike: I prefer to make this gnocchi with an egg but it will definitely work without it. Gnocchi gets heavier when you use more flour and since the dough is sticky you want to add more flour to make it easier to work with. The trick is to mix less flour into the dough and the keep it well floured on the outside as you work with it so that it does not stick to everything without absorbing all of the flour. This looks amazing Kevin and thanks for all your awesome recipe ideas! I am planning to make the gnocchi today for a late lunch, but wondered what your thoughts were on freezing the gnocchi for later. I know you can freeze your puree, but could I freeze the gnocchi and just let it thaw before I boiled it? Thanks! Evan Engle: Yes you can freeze the gnocchi. I would recommend freezing it spread out on a baking sheet so that they are not touching. Once frozen, transfer them from the sheet to the storage container. How was the consistency of your gnocchi? I'm used to the traditional recipe, using potato, and they're usually super light and fluffy. I found that these ended up being pretty gummy and thick. Maybe I added too much flour…just curious what everyone else experienced! I am definitely going to try this again with different proportions 🙂 Thanks for sharing! The Queen of Quinoa: These should be nice and light and fluffy as well. It can be a bit tricky balancing the dough being to sticky to work with and adding so much flour that they are too heavy. I find that the best way to go is to leave the dough pretty sticky to begin with and then coat it liberally with flour as you roll, slice and shape it.